We get you to the start. We cheer for you at the finish. 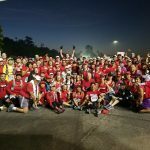 Training for the 2020 Los Angeles Marathon starts September 7, 2019! We are an official training partner of the Los Angeles Marathon. Yep, we’re certified and bonafide as such. Our training program is entirely FREE. Always has been, always will be. No cost, no how. The program can help newbies, experienced runners, and those somewhere in the middle. Never run? We got you. Run like the wind and want to get a new PR? We still got you. Loads of opportunities to run. Saturday at 7am for our long run. Midweek runs happen on Tuesday and Thursday evenings at both 6pm and 7pm. Rumor has it we’re a friendly bunch. One of the friendliest in town, actually. You just have to sign up and show up. We require no fees, no nothing. Show up at a Saturday run with running shoes, a water bottle, and high hopes. After stretches, the training groups will break out and you’ll be with your fellow marathoners. We’ve been doing this for 21 years. We’ve helped gobs of runners and we never, ever, ever lose that shiny, happy feeling we get when one of our own crosses that finish line. Interested? Here’s the training program. Remember: it’s far less daunting with a fellow Pacer running along side you. Still want to know more? 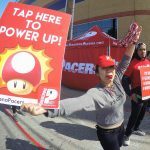 Find all more of the Pasadena Pacer who, where, and how on our FAQ page. Pasadena Pacers is a 501(c)(3) non-profit, charitable organization and donations are tax deductible.